Online education pioneer Southern New Hampshire U is launching an innovation lab to look for the ideas that will catapult the institution into the future. Many are familiar with the Southern New Hampshire University story — how Paul LeBlanc, in the depths of the recession, transformed a financially troubled but otherwise unremarkable brick-and-mortar New England institution into one of the fastest growing not-for-profit online educators in the world. However, LeBlanc, SNHU's president, was not willing to stop there. He started an innovation lab called Pathways that eventually morphed into College for America, which provides low-cost, high-quality education for adults and became the first competency-based program to grant associate's degrees eligible for federal financial aid in 2012. College for America was followed by the development of Motivis Learning, a new learning relationship management platform that is now a stand-alone startup. Fast-forward to late 2015, and the ever-restless LeBlanc was ready for the next phase in Southern New Hampshire's growth and development — which would be what? Good question, and one he has hired Michelle Weise to help answer. Weise is the former senior research fellow in higher education at the Clayton Christensen Institute for Disruptive Innovation, where she co-authored, with the institute's founder Clayton Christensen, Hire Education: Mastery, Modularization and the Workforce Revolution. Last fall, Weise became executive director of SNHU's Sandbox ColLABorative, the latest iteration of the innovation lab that over the last several fast-moving years has transformed that one-time sleepy university. The new entity will act as the research and development arm for SNHU, examining and testing new strategies and innovations, for both internal purposes (improving teaching methods or streamlining processes as needed) and external (finding and developing untapped markets and audiences for cutting-edge education). "We're trying to be an incubator," said Weise. "If we do land on something that could be a new viable business model for education, the lab will incubate the idea until it's ready to be pushed out on its own. Then the Sandbox will continue to incubate new ideas." How do we build an internal consultancy that can work with multiple business units to better serve students and improve performance? How can we partner with other institutions to find solutions to higher education's most pressing challenges? What will SNHU's place be in the next generation of performance-based assessments and immersive learning environments? Can we find a way to replicate what SNHU has already accomplished in the international arena? Although Weise didn't ask a fifth question, she might have added to her list: How do you answer those four, given what has rapidly become a highly decentralized, somewhat sprawling institution? All the more reason for a stand-alone Sandbox ColLABorative, suggested one of her former colleagues, Christensen Institute Co-founder and Distinguished Fellow Michael Horn. "One of the key tenets we learned through the study of disruptive innovations is that it's really hard to disrupt yourself in an existing model," Horn said. "Creating a new model that's away from the way things are done is really important to be able to create novel things." Contributing to that new model will be a physical Sandbox facility in an existing SNHU building that has been carefully designed to be a locus of innovation and idea incubation. Opening this week, the space that Weise and her staff will occupy will, more importantly, double as a place that others can use to brainstorm their own new ideas. As with any start-up culture, there are open spaces that allow individuals to easily interact, coupled with a handful of quieter, more secluded spaces where individuals can "hole away" to work on projects. 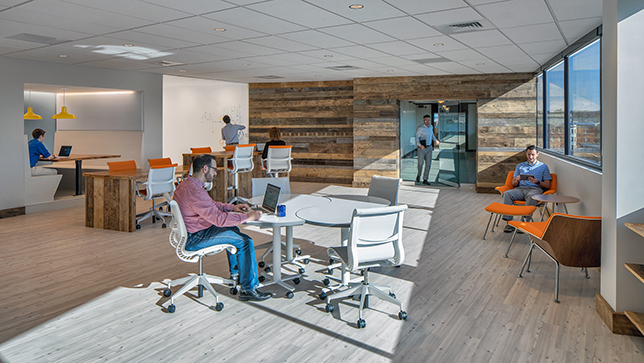 Much of the area is highlighted by wood features to give it a warmer feel, mixed in with plenty of whiteboards and chalkboards to enhance collaboration. "Sandbox is not a makerspace with fancy technology. It's a low-tech lab — and deliberately so. 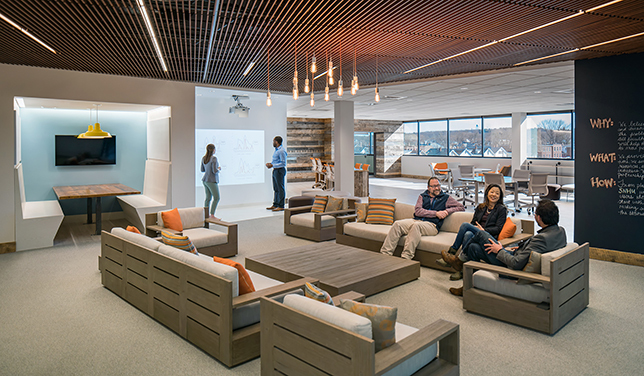 Most sections of the lab offer multiple writeable surfaces to enhance brainstorming, collaboration, movement and connection — what we call play," said Weise. "In this open and warm environment, people can move around, play and dare to take risks. 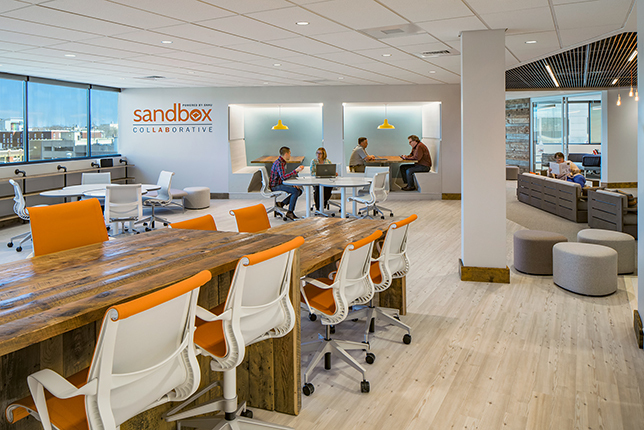 Sandbox can be your safe space for experimentation, vulnerability, failure and iteration—a special, neutral space in which you can embrace uncertainty without fear or anxiety." Weise didn't comment on any specific ideas, proposals or initiatives she and her colleagues may be working on at the moment, but she did offer some insight into the way Sandbox is working. "Any group can bring forward any idea they'd like to see developed," Weise said. "For instance, maybe there might be some folks who want to do something with flipped learning." She and her staff would help them "flesh out" their ideas and perhaps guide them through a process where they learn whether it is a concept they can turn into practical reality. "We will help them build out that idea," Weise said, "or we may help them understand there might be too many barriers involved." An example of a more externally focused idea was one SNHU recently considered: a program that would offer online education to prison inmates. "In theory, that sounded incredible!" Weise said. But as the Sandbox group worked through the R&D process, they discovered there were substantial barriers. One hallmark of all SNHU's initiatives that have achieved success has been the ability to scale — and the structure of the prison system posed a problem. "As we looked at the way the prison system works," Weise said, "we found it is so highly decentralized that we would have to almost go from warden to warden to scale a program out. There's no way we can do it as a centralized operation." Horn pointed to a few "pain points" the SNHU Sandbox will have to deal with as it looks for ways to innovate higher education in the future. One is regulatory, with many governmental or quasi-governmental institutions tied to the credit hour. "Regulation is still obsessed with the credit hour," Horn said, "very interested in inputs and not in how to think about student outputs or how to measure them." A second pain point is combating entrenched internal processes and the "old way of doing things." Finally, he added, there is the challenge of finding new processes to support students: "Figuring out how to support learners who come from different circumstances [in a way] that is low-cost but gives them the support they need to graduate." Nevertheless, Horn is as optimistic as Weise that the Sandbox ColLABorative can accomplish what Weise, LeBlanc and others want it to. "This is extremely unique," Horn said. "I can't think of any other institution that is doing what they're doing." "The key to success," he added, "will be how autonomous they can be to keep the innovations they incubate from even the innovative things they've already done. Can they protect new things from turf wars and the other things that will inevitably pop up?" Acknowledging that SNHU has quickly become a very complex, multi-dimensional organization, she emphasized that it has never needed something like Sandbox ColLABorative more than it does now. "We've gotten to the point where we need to connect people on certain issues," Weise said. "That's where we can help grow new ideas."